Frederick Douglass Autograph Note Signed. Rare autograph note signed by American abolitionist Frederick Douglass. Boldly signed, “I am, Dear Madam, With great respect, Frederick Douglass.” In near fine condition. Double matted and framed with a portrait of Douglass. The note measures 3.75 by 7.5 inches. The entire piece measures 15.25 by 10.75 inches. 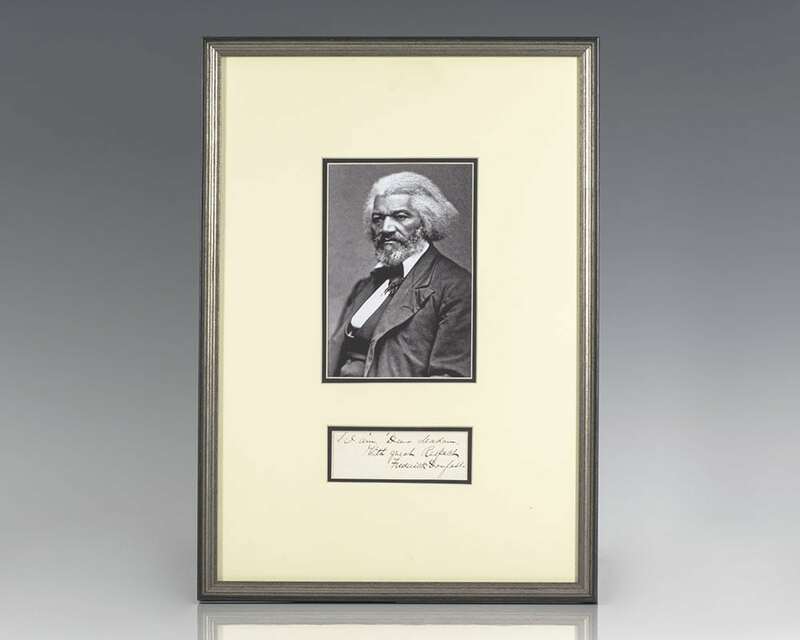 Rare and desirable signed by Douglass. After escaping from slavery in Maryland in 1838, Frederick Douglass became a leader of the national abolitionist movement gaining notoriety for his acute and powerful antislavery orations and writings. Douglass wrote several bestselling autobiographies which became instrumental in promoting the cause for abolition. A firm believer in the equality of all peoples, Douglass also actively supported women's suffrage and became the first African American to be nominated for Vice President of the United States running on the Equal Rights Party ticket.